Why do aluminum radiators work so much better than 3 & 4 core brass and copper radiators? The biggest reason is it has 2 monster 1" tubes. The large tubes do not plug as easily as the smaller tubes in brass/copper radiators. 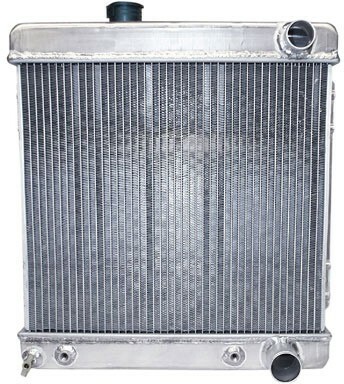 This aluminum radiator has 40% greater tube fin contact than a brass/copper 4-core radiator! This increases cooling capacity by 75%. Another plus is that these radiators are 40-50% lighter than brass/copper radiators. Measurements of heights, widths, depths and other dimensions are stated in inches. Overall Height is always the measurement including tanks. Core Height is always the measurement between tanks.